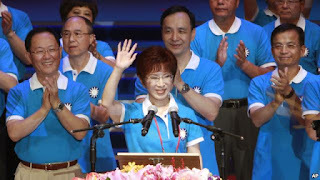 Taiwanese voters next year are all but sure to elect a woman as their next president. The ruling Nationalist Party on Sunday picked Taiwan’s deputy legislative speaker and a former teacher as their candidate. She will run against the chief opposition party’s chairwoman, Tsai Ing-wen, in the January election. Taiwan has never seen two female candidates run for the major parties or elected a woman as president. The Taiwan ruling Nationalist Party’s first female presidential nominee will compete in the January 2016 election with a woman picked earlier this year by the chief opposition party. The opposition Democratic Progressive Party candidate Tsai Ing-wen ran for the office in 2012, but against the man who is today's president, Ma Ying-jeou. She is running now against the deputy speaker of parliament Hung Hsiu-chu. Women have become heads of state in India and South Korea, among other Asian countries, but never in Taiwan. Philip Yang, spokesman for the Nationalist candidates campaign, said Taiwan stands out already because two women are competing. “It's not in other countries that both opposition — major opposition — and ruling party candidates are both female, so this is probably making this campaign very interesting,” he said. Nationalist nominee Hung is 67 years old and a former teacher. She is known best for biting and sometimes humorous questions asked of officials who are called into the legislature to explain the work of government. Her rival, Tsai, is 58 years old and lawyer by training. She lost the 2012 presidential race by six percentage points. Political observers say Taiwanese voters can accept a female president because their democracy has matured since it began in the late 1980s and women over 50 were traditionally regarded as capable clan leaders in the traditional Chinese culture that anchors Taiwan. A third of Taiwan's legislators are female, and women lead some of the island's top companies. As an indication that gender is a minor issue for voters, debate about the presidency has shifted toward one of Taiwan's thorniest dilemmas, which is its tense, but recently cordial, relationship with China. China has claimed sovereignty over self-ruled Taiwan since the 1940s and demands the two sides eventually unify. Polls indicate Taiwanese people prefer today's degree of autonomy. President Ma set aside political disputes with China in 2008 to open landmark dialogue that has led to a series of economic agreements. Hung advocates keeping up that dialogue on Beijing's condition that both sides view themselves as a single China, but with different ideas about what China means. Tsai also wants more dialogue but rejects the one-China basis for talks, making Beijing nervous. Ross Feingold, a Taipei-based senior adviser with American political risk manager DC International Advisory, says voters will consider each candidate's China policy as well as their views on economic issues. “Both candidates have been public figures for considerable amounts of time, so there are certainly things to look at in their past records or their positions on current issues that are enough to talk about without making gender an issue,” he said. Many Taiwanese want a more cautious relationship with China, and opinion surveys show Tsai leading her rival about half a year ahead of the election. The winner will replace President Ma in May as he steps down due to term limits.